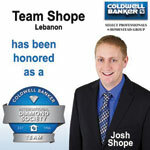 Team Shope takes pride in being a premier real estate team serving the Central PA marketplace. With nearly 100 homes sold in 2015, this dynamic team simplifies the home buying and selling process for their customers in order to take the “worry” out of the transaction. With a team of highly trained professionals and tested systems in place, Team Shope is an obvious choice for your real estate needs. Attention To Detail. Problem Solving. Straight-Forward Approach. Coming from a background in marketing, sales, and brand creation, Amanda has naturally fit into the real estate industry. Raised in a construction family in Central Pennsylvania, she knows the area well which aids in her ability to not only find the perfect location for all of her buyers but she also has a comfortable knowledge of the marketplace for her sellers. Amanda has a very straight-forward approach with her clients believing that clear communication is essential in order to simplify the real estate process. She prides herself on her attention to detail and problem solving skills and will do what it takes to get answers and results in order to keep transactions on track and her clients happy with their service.